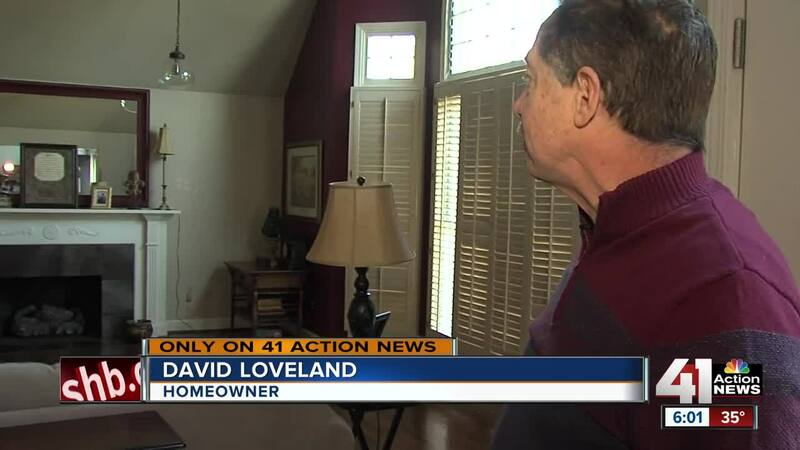 Independence homeowners David and Pamela Loveland were awakened around 6:30 a.m. on Saturday by a rude and destructive house guest. A deer smashed through a door and rummaged through the house as the frightened coupled helplessly watched. INDEPENDENCE, Mo. — Independence homeowners were awakened around 6:30 a.m. on Saturday by a rude and destructive house guest. A deer smashed through a door and rummaged through the house, frightening the David and Pamela Loveland. "I thought, 'Oh my gosh, did my wife fall down the stairs?'" David said of his initial reaction to the commotion. "Huge crash, lots of noise, and thought a tree fell on our house," Pamela said. It took more than a half-hour, and a phone call to police, to get the deer back outside. "It was still dark the sun was just starting to come up and the deer was confused and plowed right through the door," David said. The buck frantically wandered the living room, knocking over lamps and other items, until it moved to the Lovelands' bedroom. "I peeked around the corner and he was in the Jacuzzi tub and you can see, poor thing he was bleeding pretty bad and then he must have seen his reflection here in the mirror," David said. It was a surreal scene for the couple. "This is from like an Alfred Hitchcock movie or something," Pamela said. "We're in the Twilight Zone over here." Officers with the Independence Police Department cornered the deer in the kitchen, opened the sliding glass door and the deer jumped from the porch about 20 feet to the ground then disappeared into the woods behind the house. "He was just confused, so I felt sorry," David said. "I actually wasn't angry, but I just felt sorry for the deer." The Missouri Department of Conservation urges caution with deer right now because it's mating season, which can cause the animals to act differently and be more aggressive than other times of the year. The Lovelands are thankful tonight to be safe and will continue enjoying the wildlife as long — as it stays outside. "We love to see it but, yeah, we didn't actually invite them in, so we didn't expect that," Davi said. The Lovelands expect an insurance assessor to visit Monday and survey the damage, which is likely several thousands of dollars.